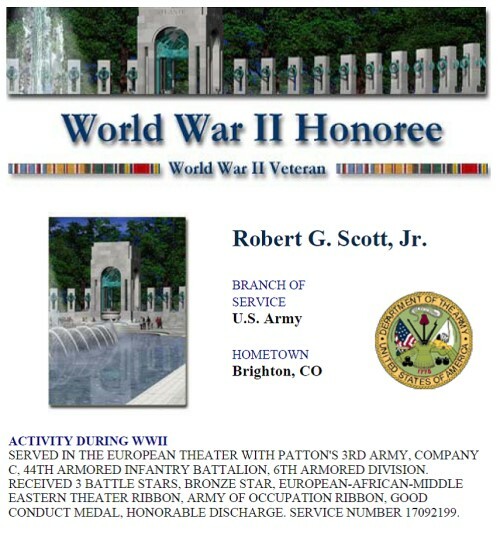 PFC Robert G. Scott, Jr.
PFC Robert G. Scott, Jr. S/N 17092199 has moved to another campaign. You can visit his Memorial at the main mall in Washington, D.C. His wish was to continue his service to the medical students at the University of Southern California. He has moved on to graduate school. I wanted you to know that my dad passed this morning at 3:30am, March 20, 2010. They said that he passed peacefully. I know that you know that he is rejoicing to be free of the body and alive in spirit. Thank you for your friendship to my father…. He loved the sharing that he had with friends…. This entry is taken from an email from David Scott, Bob’s dedicated and loyal son. As administrator of the blog, I am including it. Also, here is a link to Bob’s story about his experience in WWII. Click here!